I was up early (well, for a retired guy) at 7:15. After breakfast, a mug of coffee, and a quick trip to shave at the bathrooms (too cold for a shower) I headed out at 8:00. The batteries are down 20 amp/hrs before running the coffee pot. I'm not sure why, but the Tri Metric battery monitor seemed to reset itself after running the coffee pot. It should have added about 10 amp/hrs to the deficit for a total of -30 but as I got ready to leave it was at -3.5. I guess I'll have to read the manual! The drive was long, but boring, mostly on 4 lane roads. I did make a useful, if not obvious discovery - don't stop at McDonalds & Walmart for coffee & supplies near the University of PA on a Saturday game day. While the traffic wasn't horrible, getting out of the shopping plaza took 5 red light changes to move one car length. I wouldn't have even been able to do that without the kindness of a driver that let me in. I decided to try for the campground the GPS suggested. Sometimes that works well, other times not so good. This would be a "not so good" but usable. 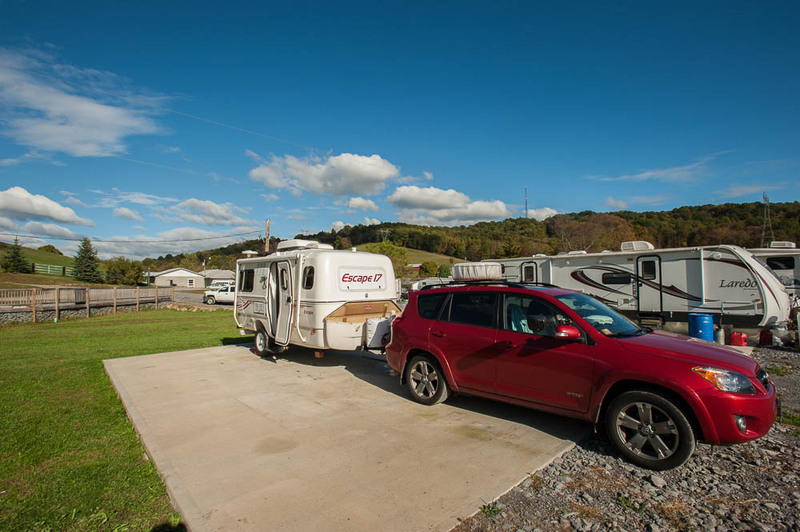 The Morgantown Campground is listed in West Virginia, but it just across the border in Mt. Morris, PA, at least I think it is. In any case, it is a residential campground with no showers or bathrooms, not even a picnic table or grill. I can set up my own table, and use the trailer's facilities, but for a transit visit, I probably could have done better. In fact, I have on past stops in Morgantown. The only photo today is the campsite image. I called Babcock State Park, and although they do not take reservations, they were pretty sure I could get an electric site tomorrow since it is a Sunday. We'll see - there isn't much else in the area so I hope one will be available. At least it is a shorter drive than today. I really prefer 150 - 200 miles; 300 is stretching it. I know many do 400 - 500 in a day, but that isn't my style of traveling.